The member's annual meeting will be held on April 24, 2019 at the Randolph Building Conference Center from 12 noon until 2 pm. There were two (2) Board of Director seats open for election. View candidates here. ATTENTION BILL PAY USERS: If you use Microsoft Explorer to access Bill Pay, you must have Microsoft Explorer 11 installed on your PC. Please update your browser. Attention: Beginning February 1, 2019 there will be a currency/coin exchange fee which is $25 for 1000 coins or $75 in coins (for each occurrence). The National Credit Union Administration is warning CUs and their members about a phishing scam that targets consumers claiming to come directly from NCUA. Some consumers have received text messages that say "National Credit Union Administration Alert for (recipient's phone number). Contact 844-234-5445." This communication is fake. NCUA does not solicit personal information via the phone or Internet. If you receive this message or others believed to be fraudulent, contact NCUA's Consumer Assistance Center at (800) 755-1030 between 8:00 a.m. and 5:00 p.m. ET. Please contact your local law enforcement as well. You may also contact the Internet Crime Complaint Center, a partnership between the Federal Bureau of Investigation and the National White Collar Crime Center. Perpetrators are once again attempting to obtain debit card information for fraudulent use. We have been notified that PTOFCU members and non-members are receiving automated phone calls on land lines and cell phones. The message says the call is from the Patent & Trademark Office Federal Credit Union Fraud Department and that the debit card of the person receiving the call has been suspended. The person is then instructed to enter their 16-digit card number and PIN or to contact a number the caller provides to reactivate. PTOFCU does not request any member information via automated calls, emails, or voice calls. If you receive a fraudulent call or email do not provide your personal information. Keep up to date with the latest promotions and upcoming events with eNews. 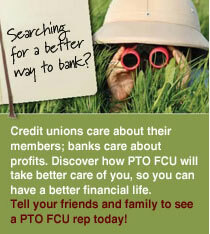 Click and sign up today or text PTOFCU to 22828. Message and data rates may apply.Sign up today. The Randolph Square Branch is open on Wednesdays by appointments only. Appointments are made for loan considerations and must be made 24 hours in advance. Call 571-272-0350 to schedule. Easy use and easy to pre-qualify. Check it out. Discounts for programs such as home warranties, moving services, temporary housing and so much more! Use your PTO FCU VISA and save. Find discounts. 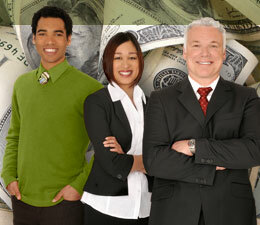 We've partnered with GreenPath Debt Solutions to provide you with educational webinars and debt counseling. Topics change every week covering items such as understanding credit reports, budgeting, home ownership and more. Get details on the next upcoming webinar here. Funds deposited into your holiday account must remain in the account until October 1st. Withdrawals before October 1st will result in the account being closed. We provide notary services for our members only. Notary services for more than two documents require an appointment. Text your location or zip code to 'MYCOOP' (692667). In order to protect you from fraud, unusual transactions may be denied for security purpose. If you plan to make and unusual transaction or to use your cards outside the United States, please call 1-877-809-4216 for credit cards and 1-888-241-2440 or 1-800-754-4128 for check cards. To Report your ATM/debit card lost or stolen, call 1-888-241-2510 toll free inside the US or 1-909-941-1398 collect outside the US. Your savings are federally insured by the National Credit Union Administration (NCUA) to at least $250,000 and backed by the full faith and credit of the United States Government. *APR=Annual Percentage Rate. Rate applies to qualified applicant. Other rates available. Version v.1.0.1 • Copyright © Patent and Trademark Office FCU 2008-2009. All Rights Reserved.